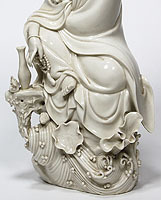 A Buddhist Chinese Blanc-de-Chine Porcelain Figure of Guanyin or Guan Yin 觀音 "Goddess of Mercy" The seated figure in lalitasana on a rock-form by the sea-shore and resting on her knee, her coiffured hair ornately tied beneath a cowl and swept up in a chignon with beads and flowers with two knotted plaits falling in tresses over her shoulders, her head facing forward with heavily lidded eyes and a serene expression, her long flowing robes open at the chest to reveal a beaded lotus pendant, her left arm under her robe while her right hand holding a strand of beads with a coral ornament. 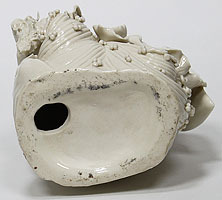 A vase and a ribbon-tied scroll rests atop the rocky protrusion while scrolling sea waves with seashells and algae awash at the base. Circa: 20th Century. Guanyin or Guan Yin 觀音 is an bodhisattva associated with compassion as venerated by Mahayana Buddhists and followers of Chinese folk religions. 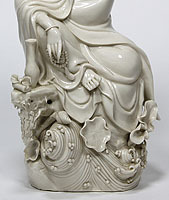 The Chinese name Guanyin is short for Guanshiyin, meaning "[The One Who] Perceives the Sounds of the World"
Some Buddhists believe that when one of their adherents departs from this world, they are placed by Guanyin in the heart of a lotus, and then sent to the western Pure Land of Sukhāvatī.Guanyin is often referred to as the "most widely beloved Buddhist Divinity"with miraculous powers to assist all those who pray to her, as is said in the Lotus Sutra and Karandavyuha Sutra. Several large temples in East Asia are dedicated to Guanyin including Shitennō-ji, Sensō-ji, Kiyomizu-dera and Sanjūsangen-dō as well as Shaolin. Guanyin is beloved by all Buddhist traditions in a non-denominational way and can be found in most Tibetan temples under the name Chenrezig. Furthermore, Guanyin can also be found in some influential Theravada temples such as Gangaramaya and Kelaniya of Sri Lanka. Statues can also be found in the Asian art sections of most museums in the world as a widely depicted subject of Asian art and sculpture. 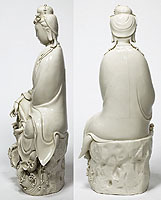 It is generally accepted among East Asian adherents that Guanyin originated as the Bodhisattva Avalokiteśvara. Commonly known in English as the Mercy Goddess or Goddess of Mercy but often depicted as both male and female to show this figure's limitless transcendence beyond gender Guanyin is also revered by Taoists as an immortal. 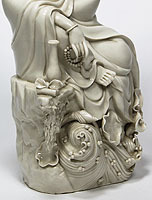 In Chinese folk religion, there are mythical accounts about Guanyin's origins that are not associated with the Avalokiteśvara described in Buddhist sutras. 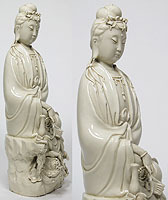 The white Blanc-de-Chine porcelain figures of bodhisattva became synonymous with the city of Dehua in the Fujian province where they had originated.